I wasn't originally going to post these reports, as I am prepping for Lock and Load and want this to remain pretty dark horse until then, but I'm just not going to get the volume of games in with the list as I want to so it's time for analysis! Recently, a list floated around in the comments section of an obscure post in the Trollbloods facebook page as one of a pair that took down Finnish Masters in the last few weeks. It hasn't popped up on the DGI database yet, but I sat down and spent about a dozen hours theory crafting with the list and then played a few games on Vassal with it. I liked it enough to try it at a recent team tournament in Vancouver, Canada. Round one I got paired with a Vancouver native named Kevin, who had a pretty standard Butcher Winterguard list paired with Strakhov 2 in Legion of Steel. Neither of them seemed impossible games for Grim, so I dropped him for the experience and Kevin played Strakhov. With the Kriel Company theme benefit, I got to go first (which is huge!) and off to the races we went. Kevin took his advance move on the Black Dragons in the middle of the table and off we went! Everything goes screaming up the table here. I have two main goals in the first two turns. Firstly, I need to force Kevin to either Feat turn 1 or to at least use his Iron Zeal mini-feat turn 1. Secondly, I need to get in position to kill the Iron Fang Kovniks ASAP to remove steady from the rest of his army. The Hooch Hauler and War Wagon are both speed 7, so they run as far as possible. Grim chucks five into the Stone and charges, and the Sea King riles for four and runs. The Thumper Crew charges to get up the table a bit, and the Stone runs like mad to keep up. Braylen goes on a flank to the right, the Feralgeist runs away from Sofia and plans to sit in the trench in the left zone for the entire game. Note the premeasured threat ranges off of the Black Dragons. I put my Wagons within charge distance if he put Quicken on them, but outside of threat range should they get Last Stand instead. All of my Engines were under the Stone aura, and if he charges me he's not shield walling and I can kill an entire unit of Iron Fangs with impact attacks if they're not under Shield Wall. Everything Shield Walls up the table, with the Black Dragons getting a Mini-Feat, the left unit getting Inviolable Resolve and the one on the right getting Quicken to get up the table a bit faster. Strakhov's unit also puts down some clouds and gets Reposition to all get behind it. The Solos all get set up to countercharge through Pikemen quite nicely. Ambush time!! My Lookouts show up in the way backfield and proceed to kill the left hand Iron Fang Kovnik, and leave the Officer for the left unit on one box. Next, Grim moves up and pops his feat, catching almost everything in it and shooting down the Kovnik on the right..until Sofia shield guards the shot. She does, however, become disabled. Grim puts Wield Secrets on the Sea King to let him ignore cover and calls it a turn. The right hand War Wagon charges in, killing several Pikemen and blasting the Kovnik off the table. On the left, the Hooch Hauler does a TON of work, lighting a ton of things on fire and killing several more models before repositioning back. The Sea King gun corrodes six Black Dragons, and he puts down a water AOE in their way. Finally, the left hand War Wagon kills a few more Pikemen. Thus begins one of the longest Maintenance Phases I've seen, as Kevin has to make about 15 effect checks and then has to decide where his upkeeps are going. About half of the continuous effects go out (sad) and Kevin just starts shield walling up the table to kill my stuff. Sofia and her friends kill my War Wagon on the top and min-feat to reposition into the right zone. On the left, nothing exciting happens. Torch kills a couple of Pygs, and the rest of the Iron Fangs move up to contest. Strakhov puts Inviolable Resolve on the right hand unit and pops his feat. Well I'm down a Wagon, but that's fine because half his army is in the back now. I corrode everything in the right zone with the Seaking, and then the Hooch Hauler lights every single Black Dragon left on fire. The War Wagon on the left knocks down or kills every other IFP with some help from Lookouts. Grm backs wayyy up after throwing out a couple of Man Traps. Braylen kills a stray Pikeman and Run and Guns back to contest the zone. Kevin rolls out a lot of continuous effects again, but he still looses seven or eight guys. He charges into the right zone, killing the objective with three pikes and failing to kill Braylen or the Thumper Crew. Torch misses the Pygs some more, and Kevin charges in Malakov and the remaining two Black Dragons to tie up the Sea King. Note the time, we have, together 39 minutes left and it's only end of three. This has been a long game. I don't have the shots in the right hand zone to clear it sadly. The Sea King bulldozes up into that zone and kills Malakov and a couple other guys. Braylen kills two Pikemen as well. On the left, I move the War Wagon up (Green Proxy) and slam the last Great Bear all the way into Strakhov. Suddenly assassination looks real possible, so I put my other two War Wagon shots into him, leaving him on about ten. Then, before I commit the Hauler, I remember Strakhov is immune to fire, so it just goes and kills the objective on the left and takes that zone. I score two points this turn pretty happily after moving Grim behind the Sea King. Some unexpected plays here. Strakhov's crew kills off the Thumper Crew, Last Stand goes on the remaining Pikemen, and they charge Grim. He gets Knocked Down, but I have two transfers to his two attacks so I'm fine. Torch charges in and does minimal damage to an engine. Pretty easy turn here. I run a Krielstone member up next to Strakhov. The Runebearer casts Mantrap on him and knocks Strakhov down. 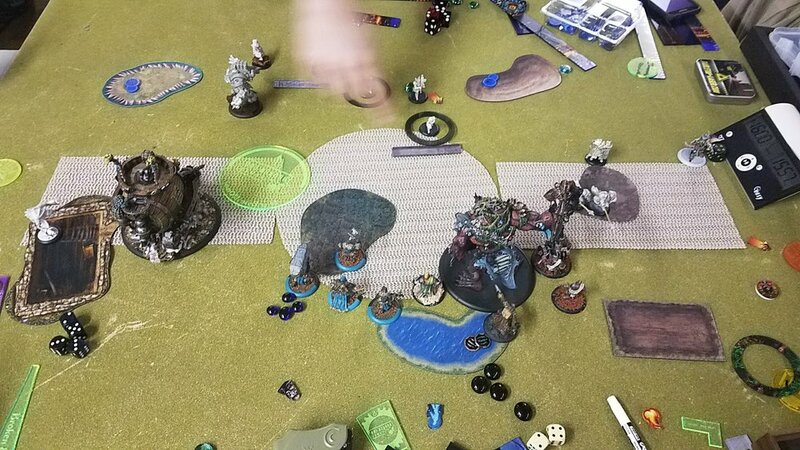 The Sea King walks up and puts the caster down after killing his Lackey's so that I can score two more points for my team. This was exactly the kind of list that I felt like the four huge bases would be strong into, and I was right. Giving up the War Wagon was a questionable choice, but I felt justified because it got rid of the Kovnik and also kept the line of engagement back for me to shoot for another turn. The Sea King gun is disgusting into Shield Wall units, and the sheer amount of continuous effects that this list puts out was surprising. Against a list that doesn't have Relentless Charge everywhere, the animus might have been a big deal too. I'd also like to thank Kevin for the game, dude was a great opponent and we had a lot of laughs through this game. Anyway, what do you think? I'd love to hear thoughts about this list, it's insanely fast, hits reasonably hard, and controls the table like mad. Looking forward to the discussions guys.